ASUS Finally Says "Me Too!" 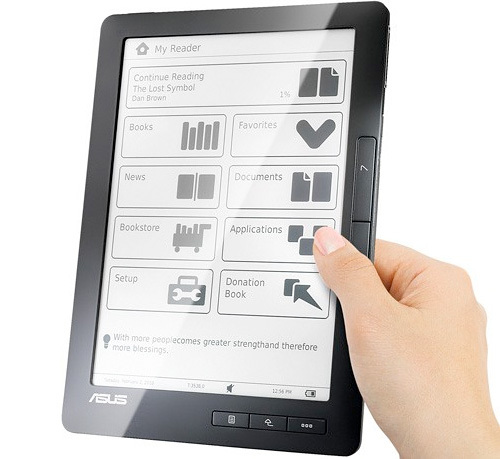 – Launches Their DR-900 eBook Reader | OhGizmo! Good for you ASUS! You looked at a crowded market that seems to double in size almost on a weekly basis and said to yourself, “I want a tiny sliver of that pie that in all likelihood will be replaced by more advanced technologies in less than a year!” Thankfully though their entry does slightly stand above the rest with a 9-inch, 1024×768 pixel resolution touchscreen e-paper display, and an overall design that keeps the hardware buttons to a minimum. It will have Wifi built-in, as well as the option for 3G, and the battery life is touted as being good enough for about 10,000 page turns, though probably less if you’re using the wireless hardware. It supports PDF, TXT, ePub and HTML files as well as MP3s facilitated by a 3.5mm headphone jack, and the 4GB of onboard storage can be expanded thanks to an SD card slot. And like the netbook market where the hardware is virtually all the same, the DR-900’s success will probably come down to how much ASUS decides to sell it for. I'll wait for the ebook reader movie to come out.